From the first day I heard about the terrible plight of the refugees in Calais (their real plight, that is, not the media myth of economic migrants desperate to come and sponge off what’s left of our benefits system) I knew I had to do something to help. I had some ideas of what would help, and discussed them with a like-minded friend. But it became apparent, from reports from volunteers at what has become known as the Calais Jungle, most of the things I had thought of were no longer needed. However, what was needed was a huge waste removal operation. We appealed for help, and had enough volunteers to fill two seven-seater people carriers. We begged, borrowed and bought shovels, garden forks, rakes, litter pickers (lots of litter pickers), industrial quantities of anti-bacterial hand wipes, gallons of disinfectant and thousands of rubbish sacks. We turned up yesterday, along with about a hundred others, and were met by the wonderful team who had organised the entire event. We were organised into teams by Médecins Sans Frontières who had assessed which parts of the site were most hazardous and the top priority for clearance. My daughters and I were wearing wellies and waterproof boiler suits we had bought in B&Q and another friend supplied everyone with cut-proof gloves, which we wore over protective latex gloves. So what exactly were we clearing up? It mainly came into four categories – food waste, packaging waste, inappropriate donations and raw human sewage. Well meaning people have been turning up at the site with large amounts of western-style women’s clothing which most eastern women would find too immodest to wear, with stiletto shoes, and with children’s toys and clothes. There are, in fact relatively few women and children – a few hundred at most, with about four to five thousand men. People had donated foods like dry pasta. But the meagre fires the refugees are able to build do not heat the water for long enough to cook pasta, so packets of it had been discarded. People have also donated really useful items like thermal socks, but they have come packaged and the packaging has been discarded. I was struck by a very great contrast between two things. The first was the question I was asked most frequently before I went, and the second was the question I was asked most frequently while I was there. 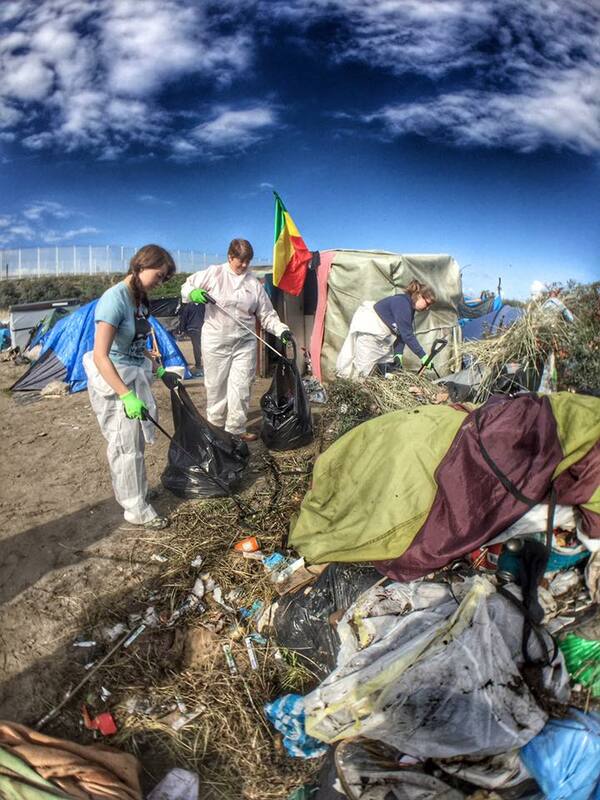 The most frequent question I was asked before I went was, “Why don’t they clean up their own rubbish?” and although I knew, from reading reports from people at the Calais Jungle, that the refugees were in no fit state to clear their own rubbish, it was hard to articulate exactly why. But it didn’t take very long on the site for the reasons to become crystal clear. I identified three reasons from my own observations. Firstly, everyone I met was stick-thin. These people have walked hundreds of miles, with very little food, to get here. They are exhausted, sick and traumatised. Most have had to leave everything and everyone they love behind and are depressed, and sick with worry about their families. All are facing a fearful, uncertain future which has completely demoralised them. That is the first reason. (This, incidentally, is why many have smart phones. If you and your family had to flee at short notice and got separated, ending up in different parts of the world, what’s the one thing you would grab before you ran? I bet it would be your phone, with all their contact details in it, so you could find out where they were and indeed if they were dead or alive). The second reason is that the French government appears to have taken a decision not to carry out waste management at the site. There is not one single waste bin anywhere to be seen – not one, between five thousand people. Some private donors have managed to rig up a few chemical toilets in cabins at one part of the site – about one for every five hundred people, and for many a very long walk from where they are staying. So imagine if you were living with five thousand people in tents and flimsy frames covered with tarpaulins, with not one waste bin between you. Where would you throw your rubbish? Imagine if you had a fifteen minute walk to a toilet you shared with five hundred others. What would you do when you were desperate? And if you had not one shovel, not one rake, not one litter picker and not one rubbish sack between you all, how much of your own waste would you clear up? There was evidence in some places of attempts to burn rubbish but most was far too wet to burn. The third reason is that the British government, despite its austerity plans, has found nine million pounds to spend on the Calais Jungle. And on what, you may ask, has it chosen to bestow this largesse? A safe sanitation system just in time to prevent the inevitable cholera outbreak in Northern France which some successful stowaways will import into southern England? A system of waste disposal points and a fleet of waste removal lorries? Well no, actually. It has spent it on a triple-layer razor wire fence. If like me, you wondered what is the difference between barbed wire and razor wire, where barbed wire has merely spikes, razor wire has blades. So while the French government has set up insanitary conditions that make a cholera outbreak highly likely, the British government has set up the overcrowding that makes it pretty well inevitable. We set to and began clearing the waste. My heart sank when I saw the huge mountains of it, and smelled the unbelievable stench. But I was astonished at how quickly a dozen willing, properly equipped volunteers can clear an area. It was really heartening to see the vast piles rapidly bagged up and stacked ready for the removal which, goaded into action by this day of volunteering, the local authorities had agreed to provide. The most frequent question I heard while I was working at the site was from the refugees themselves, and it was this: please may I have some of your rubbish sacks? Inspired by our efforts, many of the residents joined in enthusiastically. One man of indeterminate age – anything from fifty upwards I would guess, of probably Syrian appearance, dressed in a thobe, the loose ankle-length garment often seen in African and Middle Eastern Muslim men and a kufi hat on his head, shod only in flip-flops, joined in tirelessly throughout the whole day. His English was limited but he communicated constantly in the universal language of a smile. My youngest daughter was struggling by herself to fill a rubbish sack using a garden fork and a litter picker. Two lads, probably younger than herself, came and gestured at her tools. When she hesitated, uncertain of their meaning, they smiled and gently relieved her of her implements, then set to with a will, filling sack after sack while she held it open for them. The reality is that, given the wherewithal, these people who feel the shame of living like this just as acutely as we would feel it, would keep their own site clean and tidy. But the governments have chosen to let them live like this, stripped not only of adequate shelter and sanitation but also of human dignity. At times we were clearing the areas around the primitive water taps that had been erected. Regularly throughout the day, people in search of drinking water would vie with us for space on one side of the row of taps while on the other, devout Muslims performed wudu, the ritual washing that takes place before each of the five daily prayers. I was impressed by their devotion – my daughter used the word integrity – that even in this extreme situation they still kept the faith and observed their religion. I also felt a little awkward and embarrassed to be picking up litter from in front of them while they performed this duty – as though something mundane was impinging on something sacred. At the end of the day we either threw away or thoroughly disinfected every implement we had used. We jettisoned our gloves and boiler suits. We took it in turns to stand in a bucket of disinfectant in our wellies before removing them and putting our shoes back on. We carried out the best infection control we could before bringing anything we had used back to the UK. As I left I reflected on two things. Firstly, that if a farm was keeping animals in this condition, the RSPCA would close it down and prosecute the owners. And secondly, I was remembering an article I had read in which the author had calculated that if every single one of the residents of the Calais Jungle was allowed into Britain and given the allowance to which asylum seekers are entitled of around thirty-six pounds a week, it would cost every man, woman and child in this country fifty-seven pence a year during the short period of recovery before they found jobs and started contributing back to our economy. I believe this is a scandal. 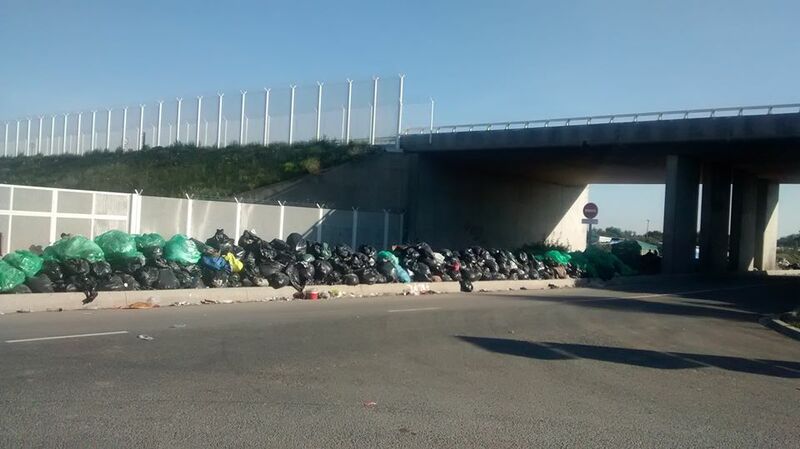 I will certainly be going back to Calais to do some more waste clearance, and I hope that between a few of us we can set up enough crowd funding to start to pay for bins and some kind of toilets. If I had my way, I would love to invite the Foreign Secretary, the Right Hon. Philip Hammond MP to come with us on our next waste-removal trip. I would buy him a dictionary so he could occupy himself on the journey looking up the meaning of the word marauding. In the meantime, those of us who went yesterday from our area, and a few others who are inspired by what we had to tell, will bless the Calais Jungle in word and deed, and hope to go on blessing it right out of existence, looking forward to a day when these people have a safe, clean shelter to live in and a dignified way of providing for themselves and their families. 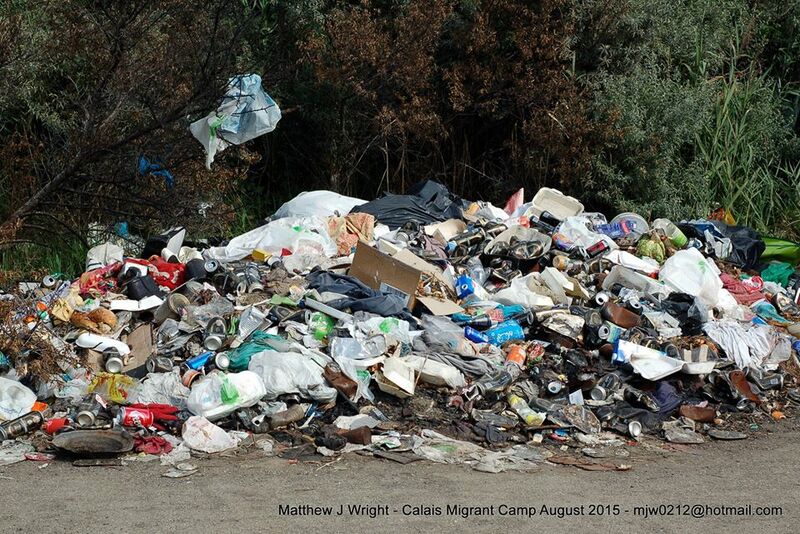 Footnote: Three days after we cleared the rubbish, the Calais Mairie has still not carried it away. One almost begins to think the two governments have a reason for wanting to encourage an outbreak of disease – can it be that, as with the abandonment of Mare Nostrum, they want to use deaths as a cynical deterrent, “pour encourager les autres”? If so, they are no better than the Assad regime or the ISIS fighters from whom these people have fled for their lives. Closing borders is bad enough. Engineering mass deaths is an atrocity. 1. What does the bill propose? The bill would allow someone who has a terminal illness and is expected to die in the next six months to request a physician-assisted suicide provided that they have a voluntary, clear, settled and informed wish to end their own life, and have been offered all palliative care alternatives. It does not allow a doctor to end a patient’s life, but allows the doctor to give the patient whatever drugs and assistive devices they might need in order to end their own life. 2. What has happened in other countries which have a law like this? • There is no real way to ensure that someone is not being coerced into taking this decision e.g. by relatives who stand to benefit from the person’s will. • Very tightly defined laws have gradually expanded to include many cases originally outside the remit of the law. This has happened not by amendments being made to the law, but by stretching the definitions of terms included in the law – e.g. “unbearable pain” has been extended to include depression and “terminal illness” to include psychiatric conditions previously considered treatable. • A massive year-on-year increase in the numbers of assisted deaths has ensued. • There have been disputed cases where it is believed someone was killed against their own or their family’s wishes. • The practice has gone beyond voluntary assisted death to involuntary euthanasia. • There is not one single example of a country where this law has been enacted and these effects have not been observed. 3. Are there any other worrying factors? • There has been a blurring of ethical lines, so that organisations drafting and promoting the legislation are distributing the lethal drugs, and stand to profit financially as well as ideologically from an increase in assisted deaths. • There is evidence of doctors failing to report assisted deaths to the proper authorities, so that the reported assisted deaths do not accurately reflect the actual numbers. • A breakdown of trust has occurred between doctors and patients so that in Holland 10,000 people now carry anti-euthanasia passports for fear of being killed by doctors in the event of an illness or accident. • In this country, Baroness Warnock has been advocating for a duty to die, that people should not have the right to be a burden to their relatives or the NHS. This is morally very different from a right to die. 4. Does assisted suicide always work? According to a BBC report, attempts at assisted suicide fail to lead to an easy death in almost one in five cases. There is evidence from Holland and Oregon of supposedly fatal doses leading to nothing other than gasping, vomiting and comas from which the patient later recovered. In 18% of cases doctors felt the need to intervene. In countries where active euthanasia is permitted, this intervention takes the form of the doctor administering a lethal injection. The Marris bill does not provide for active euthanasia so we can expect to see cases like the one in Oregon where, after a man took the prescribed dose of lethal drugs, physical symptoms were so disturbing that his wife called 911. He was taken from his home to a hospital where he was revived. 5. Why shouldn’t people have the right to an assisted death? • It is usually the “worried well” who favour assisted suicide – all the major disability organisations in this country oppose it because of the danger it would pose to vulnerable disabled people. • There is abundant evidence that such laws lead to mistakes and abuses which can never be put right. • Financially hard-pressed NHS trusts will be tempted to offer assisted death instead of costly treatment. • As a society we have always been clear that suicide is not something to be encouraged. This law would change that, and in so doing would change something fundamental in the foundations of our society. 6. What is a Christian response? • The Bible has always been clear that humans are made in the image of God, and to take a human life is a grave sin. • These truths are also enshrined in the Catechism of the Catholic Church. • Jean Vanier points out that our value comes not from the quality of our life or our ability to be productive but from being loved by God. • This law would damage both the protection for vulnerable individuals and the nature of our society. • It is part of being human that we show compassion to people at the cost of some personal sacrifice, rather than viewing them as a burden. • The only guaranteed safeguard to disabled people’s right to life is not to have an assisted dying law. 7. What can I do? • Contact your MP (www.writetothem.com) Most of them have not yet decided how to vote. Your email might sway your MP. • Pray. There is a battle for the heart of our country and we should be employing our spiritual weapon of prayer in the fight against evil. On 11th September 2015 the House of Commons will debate the Assisted Dying Bill, a private member’s bill put forward by Rob Marris, the MP for Wolverhampton South West. The bill, as drafted by Rt Hon Mr Marris, draws on earlier bills put forward by the Lords Falconer and Joffe. Provision is made for the patient to revoke the declaration at any time, and this revocation must be implemented whether or not it is made in writing. Where the patient does not revoke the declaration, they will be given the lethal medication and any medical devices they might need with which to administer it, and it is then up to the patient to take the medication and end their own life. The bill does not provide for the physician to administer the lethal medication; only the patient is authorised to administer it to him/herself. The doctor is required to remain with the patient until the medication has been taken and the patient has died, or until the patient has decided not to take the medication. However, “remain with” can be interpreted as being somewhere in the vicinity, not necessarily at the patient’s bedside or even in the same room. No medical practitioner can be obliged to assist a death if their conscience precludes them from doing so. The remainder of the bill deals with practical matters such as how the medications should be safely stored, transported and delivered, what should be inscribed as cause of death on the death certificate (“assisted death”), what codes of practice and monitoring should be associated with the proposed new law and what constitutes an offence. Where a false declaration is made purporting to be by someone else with the intention of bringing about that person’s death, the offence would be punishable by life imprisonment. All other offences under this law would be subject to fines or terms of imprisonment of between six months and five years maximum. Any reasonable person reading this might conclude that the remit of the bill is very narrow, the safeguards extensive, and the exclusion on conscience grounds fair and just. The questions remain, would there be any danger of the remit being extended, and are the safeguards adequate? The bill, as drafted, presupposes that assisted suicide is a tidy and effective solution; but is that assumption underpinned by good evidence? To answer these questions, we can look at other places where similar laws have been enacted. Euthanasia remains illegal in Holland even today. But since 2001 it has been decriminalised for the medics who practise it (and even before that the practice was to overlook it) provided certain criteria are observed. The person requesting it must be conscious, mentally competent and in unbearable pain. The request must be voluntary and made or reiterated after all other palliative options have been explained and the patient given time to consider them. More than one person must be involved in the decision, and there must be no other solution to the unbearable pain. The fact that a patient had received euthanasia must be promptly reported to the proper authorities by the physician. • 2,300 people died as the result of doctors killing them upon request . Dr Theo Boer, who teaches ethics at the Protestant Theological University in Groningen and spent nine years on one of the regional euthanasia evaluation committees, believes that euthanasia, which was originally introduced to protect doctors, quickly came to be regarded as a patient’s right. “The debate has changed. Euthanasia is no longer a last resort. It was originally seen as a law that gave doctors rights rather than patients. But we very frequently hear it discussed in terms of a patient’s right to euthanasia.” For example, a businessman who becomes bankrupt could argue that his financial situation is causing him unbearable pain and could request euthanasia as a result. Euthanasia, originally available only to competent adults, is now available to children from aged 12 with parental consent, and from age 16 with parental involvement in the discussion, but not necessarily their consent. There are people in Holland calling for it to be extended to children under 12. Dr Boer fears that before long euthanasia will come to be seen as the right of anyone over 70, no questions asked, and that there is a growing phenomenon of “duo-euthanasia” where the partner of a terminally ill patient asks to die with them because they cannot face the thought of life after the person has gone. There has even been one case of an eighty year old woman whose family requested assisted dying for her, but doctors refused on the grounds that she lacked the mental capacity to take the decision herself. The woman’s GP, the management of her care home, and her psychologist all supported this decision and requested an independent report into her condition. A judge sitting in emergency session overruled them all, and she was killed by a lethal injection the next day. In the US state of Oregon, physician-assisted suicide has been legally permitted since 1994. This law allows terminally ill adult Oregonians to obtain and use prescriptions from their physicians for self-administered, lethal doses of medications. Since then, the number of such prescriptions issued has risen from 24 in 1998 to 122 in 2013, and the number of those prescriptions actually used to procure deaths has increased from 16 in 1998 to 71 in 2013. Between 1997 and 2013 there were 752 such deaths in the State of Oregon. The majority of these patients had cancer, were over 65 and died at home, although some were as young as 42. These figures show show that once assisted dying is permitted for the very few to whom it might be seen as desirable, it is only a matter of time before the numbers escalate. In addition, since the law permits these lethal drugs to be self-administered without the oversight of a doctor, there is absolutely no way of telling how many people make a free choice to end their lives in this way versus the number for whom this is an additional means of elder-abuse. “Jenny (not her real name) was a week or so short of her sixtieth birthday when she came into the hospice. She had advanced cancer and she, and her family, knew the end was close. And her family were devoted. Not a day went by without one or more of them at her bedside. We stabilised Jenny’s condition; she was comfortable, more independent and able to have quality time with her family. And, as often happens with good palliative care, the prospect of her imminent death receded. Then came her birthday. It was a muted affair, but understandably so as it was clearly her last. Most of the assisted deaths in Oregon are of white, middle-class, retired people – precisely the ones whose heirs are likely to benefit substantially from their deaths. This immediately makes a whole class of older people extremely vulnerable, and there is little in Mr. Marris’s bill to prevent this kind of pressure being put on elderly people out of sight of the physician. Moreover, in Oregon which does not have a UK-style National Health Service, there have been some well-publicised cases of health insurance companies offering patients euthanasia as an alternative to cancer treatment. Here in the UK, where our hospitals are increasingly under financial pressure and some are close to financial collapse, the temptation to suggest, persuade or induce patients to accept an assisted suicide as an alternative to costly treatment is immediately evident. Only the most naïve person would tell himself that this will not happen if this law is passed. Already in the UK, healthy young people with a normal life expectancy are regularly told that it is an NHS requirement that at every annual review they should be invited to have “Do Not Resuscitate” written on their medical notes simply because they have a disability. So we would be foolish to think that death would not be considered as a cost-cutting measure; clearly it already is. One wife in Oregon describes taking her seriously ill husband to the doctor: “I collapsed in a half-exhausted heap in a chair once I got him into the doctor’s office, relieved that we were going to get badly needed help (or so I thought). “To my surprise and horror, during the exam I overheard the doctor giving my husband a sales pitch for assisted suicide. ‘Think of what it will spare your wife, we need to think of her’ he said, as a clincher. “Now, if the doctor had wanted to say ‘I don’t see any way I can help you, knowing what I know, and having the skills I have’ that would have been one thing. If he’d wanted to opine that certain treatments weren’t worth it as far as he could see, that would be one thing. But he was tempting my husband to commit suicide. And that is something different. You might suppose that having a legal route to assisted suicide might decrease the general suicide rate among ill and depressed people, but no such effect has been observed either in Oregon or in Holland. Although one of the criteria for eligibility is that the patient is expected to die within six months, figures from Oregon show that in 2013 eight patients died after taking lethal drugs prescribed for them in 2011 and 2012. In other words, the estimate of less than six months life expectancy was wildly inaccurate in a significant number of cases. Tom Mortier, whose severely depressed mother died by euthanasia, unbeknown to her family, in a Brussels hospital, is challenging Belgium’s euthanasia law in the European Court of Human Rights. He says that part of the cause of her depression was her estrangement from her son, and that had an attempt been made to contact him and put him back in touch with her, she would probably not have opted for euthanasia. His lawyer points out that she was offered death rather than treatment. From this it can be seen that a huge leap has been taken from people whose cases are “medically futile” and “incurable” to a woman who is depressed over her family breakdown and is offered death in preference to treatment. Nor did the Belgian law stop there. In 2014 it was amended to extend the right to euthanasia to children. In the four years to 2013 the number of people dying by euthanasia increased by 89% and now represents 1.7% of all Belgian deaths. Assisted suicide has been legally condoned in Switzerland since 1918, and does not have to be carried out by a doctor provided no self-interest is involved, but records are not available for the period prior to 1998. From 1998 to 2009 the numbers rose from 43 to 297 per year, with women accounting for 55% of cases. By 2012 this figure had risen to 508. (These figures only include Swiss nationals, and do not take account of foreigners, including one Briton per fortnight, coming to end their lives at the Dignitas clinic). The law permits anyone to provide someone with the means to commit suicide but stops short of allowing a doctor to carry out euthanasia on a patient. In principle Swiss law provides for an assisted suicide only if the person has a terminal illness, but there have been reports of assisted deaths in the Dignitas clinic of people whose clinical diagnosis was depression. I have not been able to find one solitary example of a country where assisted dying has been legalised in which this has not opened a floodgate to an ever-rising tide of deaths from this cause. No matter what safeguards have been put in place, a gradual erosion of ethical standards has taken place resulting in constant widening of the eligibility criteria for an assisted death. In the majority of cases this has taken place not by enacting new laws but simply by stretching the definitions of the terms included in the existing laws. There are other concerns regarding a gradual slide in ethical standards. The case of Compassion and Choice profiting from the sale and distribution of lethal drugs while it pushes a pro-euthanasia agenda on the public should give us pause. We already know that in the UK drug companies offer inducements to NHS personnel in the hope of increasing sales of their drugs. In fact, in 2013 an undercover investigation found that dozens of NHS officials in control of medicines budgets were being paid thousands of pounds by drug companies. The potential for a profitable and persuasive euthanasia industry to spring up as has happened with the abortion industry in this country means that many of the safeguards in Mr Marris’s bill would not be worth the paper they are written on. Already the debate in this country has progressed beyond the right to die, to the duty to die. In 2008 Baroness Warnock, arguably our leading moral philosopher, surprised many people when she asserted that pensioners in mental decline who require a lot of care are “wasting people’s lives” and should be allowed to opt for euthanasia even where they are not suffering pain. She saw nothing wrong with people being assisted to die for the sake of their loved ones and of society, and said that she hoped people would soon be “licensed to put others down” where those others were no longer able to look after themselves. Her comments related particularly to dementia sufferers, of whom she said, “If you’re demented, you’re wasting people’s lives – your family’s lives – and you’re wasting the resources of the National Health Service…. Actually I’ve just written an article called ‘A Duty to Die?’ for a Norwegian periodical. I wrote it really suggesting that there’s nothing wrong with feeling you ought to do so for the sake of others as well as yourself.” With such views informing the public debate, it is in vain to hope that we alone of all the countries who have tried it would be able to contain the effects of an assisted dying law within its original narrow confines. Parents like myself, who have disabled sons and daughters lacking the mental capacity to take their own decisions in these matters have real reason to fear for our youngsters’ safety once we are no longer here to fight for them. It should come as no surprise, then, that it is mainly the “worried well” who support this law, those who have not personally experienced a life-threatening condition and fear that if it happened they could not endure it. By contrast, this bill is opposed by all the UK’s major disability organisations, which represent those who have experience of pain, weakness and limitation and have found the joy of living nonetheless. According to a BBC report, attempts at assisted suicide fail to lead to an easy death in almost one in five cases. There is evidence from Holland and Oregon of supposedly fatal doses leading to nothing other than gasping, vomiting and comas from which the patient later recovered. The report quotes Dutch doctor Johanna Groenewoud: “Patients who wish to receive help in dying face a small but nevertheless worrisome possibility that some untoward event will prevent the accomplishment of their wish.” In 6% of cases, patients either experienced an unexpectedly lingering death or awoke from a coma that was supposed to have been fatal. 7% of cases led to technical complications or unanticipated side effects, and problems were so frequent that doctors felt compelled to intervene in 18% of cases. If problems of this magnitude were known to be associated with any normal medical procedure, I am fairly sure it would have been widely reported in the press and patients would be wary of the procedure. In one case in Oregon, after a man took the prescribed dose of lethal drugs, physical symptoms were so disturbing that his wife called 911. He was taken from his home to a hospital where he was revived. Yet I have never heard these risks mentioned by proponents of assisted suicide. In the same article, Dr Fitzpatrick makes the point that three prominent campaigners for assisted death, all of whom were terminally ill themselves, have recently died a good death, peacefully, in palliative care or hospice settings, proving that there is no need for the change in the law for which they campaigned, nor for the fear which prompted their campaigns. Another supporter of these arguments is Liz Carr, the actress and comedian. She begins her article by stating, “I’m not religious, I’m not anti-choice and yet I, along with many other disabled people who are involved in the international organisation Not Dead Yet, oppose the legalisation of assisted suicide.” Ms Carr goes on to explain her view that Mr Marris’s bill, if passed, would lead to some people’s lives being ended, without their consent, through mistakes or abuse which could never be undone. She maintains that we should have not an assisted dying bill but an assisted living bill. And she rightly reminds us that the only effective safeguard that has ever been found against such mistakes and abuses is not to have an assisted dying bill. Disputing that this bill would lead to greater choice, she reminds us that many people who wish for a hospice place or to die at home are denied their wish, and more people die in hospital in the UK than in most other European countries. She therefore suggests that we should do more to give people the natural death they wish for before we start ploughing our resources into ending their lives instead. Her final and most compelling point is that safety of the many must take precedence over the wishes of the few. “Laws on ‘assisted dying’, like the one tabled by Lord Falconer and debated last year in Britain’s House of Lords, are written as if everyone is a strong-minded, no-nonsense individual and never susceptible to depression or influence or doubt. But I must tell you, most patients facing an approaching death just aren’t like that. They are struggling to come to terms with their mortality, veering between hope and despair and back again, worried about the impact of their illness on those around them and trying to make sense of what is happening to them. In a word, they become vulnerable.” She goes on to emphasise that many people who support assisted dying lack the imagination to project themselves into a situation where they might be, for example, tempted to coerce someone for unscrupulous reasons. Baroness Finlay has abundant experience on which to draw; she has had plenty of encounters with terminally ill patients who thought they wanted to die, who would have met the criterion of having a “settled intent” to die, but with the right care and attention recovered their zest for life. Finally, she makes the powerful point that laws are not simply instruments of regulation: “They send social messages. As a society we are clear that suicide is not something to be encouraged or assisted. Legalising assisted suicide flies in the face of that. It sends the message that, if you are terminally ill, ending your life is something that society endorses and that you might want to consider.”  And she concludes by asking if that is the kind of society we really want to live in. The Church of England’s national director on medical ethics, Rev Dr Brendan McCarthy has put out a very helpful analysis of the proposed law from a Christian point of view. Like Baroness Finlay, he believes that this change in the law would damage both the protection for vulnerable individuals and the nature of our society. He emphasises that even when people have lost the sense of the value of their own lives, this does not diminish the intrinsic value that they have as a human person. This is a principle fundamentally embedded in our laws, and to alter it would alter the very values on which our society is built. The fact that at times these people might need to be cared for at the cost to others of some sacrifice is simply a manifestation of the compassionate nature that characterises us as humans. Dr McCarthy recognises the impotence of the safeguards in this law to prevent all abuse. Such safeguards have not prevented the escalation of incidences of assisted suicide in every other country where they were introduced to cater for the tiny minority who wished to benefit from them. Nor have they prevented those laws from being used to despatch inconvenient elderly or incapacitated people by those who stand to benefit from the death. He concludes by calling for us to put our energy and resources into best-quality palliative and end of life care. I attended a talk last Friday given by Fiona Bruce MP. She told her audience that many MPs simply do not have a view on assisted dying, and are waiting to see what representations they receive from their constituents. So one of the most influential things you can do is email your MP  and urge them to turn up for the debate on Friday and vote against the bill. Euthanasia: Report of the Working Party to Review the British Medical Association’s Guidance on Euthanasia, British Medical Association, May 5, 1988, p. 49, no. 195. I.J. Keown, “The Law and Practice of Euthanasia in The Netherlands,” The Law Quarterly Review (January 1992), pp. 67-68. Abner Katzman, “Dutch debate mercy killing of babies,” Contra Costa Times, 7/30/92, p. 3B.